Welcome one and all to The Comm Guild - the official blog of Maelstrom's Edge! After a year of operating maelstromsedge.com, coupled with recent changes in the way facebook works, we found that updates were getting harder and harder to share with everyone, and loads of casual bits of information and cool community items were getting buried rather quickly. JP proposed that we set up a frequently updated blog as the central point for our communications, and now you are reading it here at The Comm Guild. Over the coming weeks, months and years, we'll be sharing everything from release news, to promotions, to fiction and artwork, to model breakdowns and more. Please bookmark us (CTRL-D), or add us to your blog reading list so that you dont miss anything! When the technology for the cybel network was first discovered and human explorers set off searching for new worlds to colonise, the practice was incredibly risky. Small ships were required to jump ‘blind’ into tunnels, with no idea where they would emerge. Many adventurous prospectors joined the rush to look for inhabitable worlds. Sending larger ships was not possible without a gate being present on the other side of the cybel tunnel, so the smaller scout ships would jump through with enough equipment to build a gate, allowing larger colonisation ships to come through. Over time this coalesced into an official organisation, encompassing the adventurous prospectors, the engineers of the gates and the staff that would run the completed gate space stations. Originally they were known as the Wardens or Gatekeepers, but gradually as the cybel network grew their name changed to the Comm Guild, to represent the main currency for the operators of the cybel gates: information. One of the peculiar quirks of the cybel network is that it can often take longer to travel between a star and one of its planets by sub-light than it takes to travel to another star system by the cybel network. This has resulted in an elaborate system of communication and trade based around the space stations located close to the cybel gates orbiting a star. Most of the large trading vessels travelling through the cybel tunnels do not have a planet as a destination. Instead, they dock for a few days or weeks at the cybel gate, offloading and onloading passengers, freight, and information. The offloaded material is carried in system by sub-light transports, and new information from interstellar travel is beamed to the system’s planets from the cybel gate’s station. In this way, the local Comm Net is updated with news and discoveries from other systems, whilst the departing ship will take a copy of the local information net with them when they leave which they share with others in the cybel network. Naturally this mode of communication brings with it certain inefficiencies. The further away an event, the longer it takes to reach a planet, and in some cases news can be second or third hand information. Worse yet, if the network links between two star systems are convoluted or disrupted news may go missing or never be transferred. Prior to the Maelstrom, there were hundreds of agreed trading routes, most travelling in a circular fashion out from the Capital Worlds to the inner rim, taking the shortest paths to each world. The Comm Guilds ran these touring craft, and became powerful players in the galaxy, trading information and resources to worlds across the Spiral Arm. The Maelstrom ripped apart the lives of the Comm-ships, more so than perhaps any other group of people. 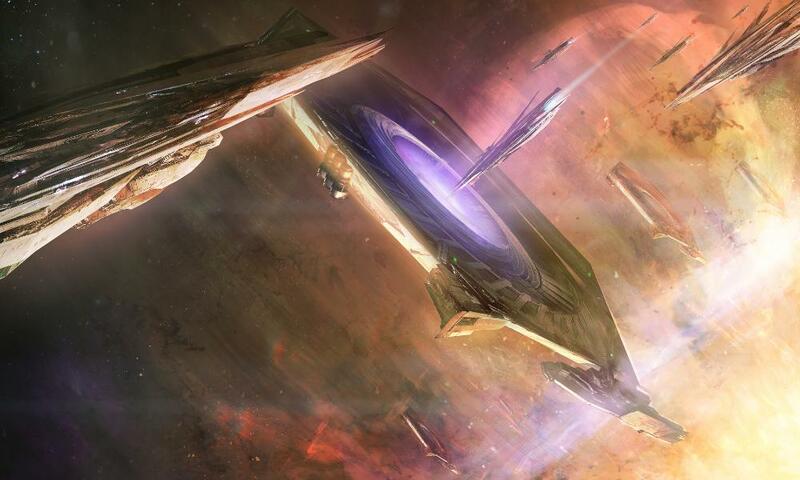 Ships at the core were destroyed instantly, whilst others inadvertently travelled into the Maelstrom’s path as news of the destruction had not made it out. The trade and communication links that had crystallised out of millennia of using the cybel network were destroyed forever. Although attempts have been made to restructure the circular communication trading routes, it has proven impossible all along the Edge. With the onset of the Maelstrom the Comm Guild has begun to evacuate staff from gates near the Edge of the Maelstrom, leaving the previously sought-after assets abandoned or manned with a skeleton crew to keep the gate open for straggling stellargees. With the loss of much of their wealth and power the Wardens close to the Maelstrom have become more pliable to bribes for travel, allowing dangerous groups of pirates and cults to utilise the cybel network. Some of the more audacious pirates have begun to utilise larger ships and have captured significant gate stations. In addition, the closure of some cybel tunnels by the retreat of the Comm Guild has led to many evacuation ships and planet-bound refugees being abandoned entirely. Another facet of the Comm Guild are the Darkeners, a secretive organisation set up thousands of years ago in the aftermath of the vast and destructive AI wars that occurred shortly after the birth of the cybel network. During the AI wars, thousands of worlds and billions of people were killed by the whims of warring digital minds. The Darkeners are a small group of handpicked operatives who operate within the Comm Guild. They monitor the technological advancement of civilisations across the Spiral Arm, and send out clandestine strike teams to destroy any system that has the potential to become sentient. Extremely elite trained soldiers with advanced equipment and weaponry, the Darkeners utilise the information traded at cybel gates by the Comm Guild to watch for AI developments and act when warranted. As the Maelstrom disrupts this flow of information and the ability to travel across the Spiral Arm, the job of the Darkeners to monitor nascent AI becomes harder, leading to the possibility that the AI singularity might occur somewhere.